the rare navy mounted yasukuni-to. Rare, perhaps. 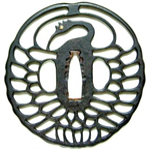 Very nice Navy mounts, and I think Yasukuni To are rare and desirable enough not to need dressing up. My guess is either a presentation piece, or someone wanted a good blade, and not a rust-resistant one. Shore based Navy perhaps. Recall reading on here that Yasukuni-To in Naval mounts were often associated with Imperial Gifts or other such awards/prizes. The comment about sharkskin Saya meaning it was for a high ranking officer is somewhat suspect as Kai Gunto fairly regularly have sharkskin wrapped Saya. Just in case there is confusion about Yasukuni tosho selling swords to the Navy...A friend of mine here in Australia picked up a Navy mounted Yasunori from his WWII veteran uncle about 25 years ago (dated I think 1937). No way it was a re-mounted Yasukuni...definitely an original Navy mounting. Also, look on p.75 of Yasukunito and you will see one sword on the "purchaser" list was purchased by Navy officer Sasaki in Showa 12.